they are capable of being." We can't all make it to the top. We can't always have great players. We can only do the best we can with what we have, both with our teaching abilities and with the players we have to work with. However, that shouldn't be a crutch for coaches to prop themselves up with when the wins are fewer than the losses. Sure, lots of us remain in situations for the love of what we do, where we are good coaches in programs that will never be at the top. But, this is where the real challenge lies--are we losers because we don't win? Are the players losers who play on a team that just doesn't have the talent to go the distance versus the more talented? We have to look at the players and communities we serve and know we really are doing the best we can do at teaching the game where the talent pool just isn't there. If we focus on being the best we can be--on teaching and preparing our players to play at the best of their abilities and guiding them to be good young men and women--we win. If we have instilled this same focus within the spirit of our players, then they too win. Coach John Wooden has been quoted often to the effect, saying, "We have no control over how good the other players are or over how well they are prepared. We do have control over how well we prepare, and if we've done our best, even in a losing effort, we have still won." Now is the time to take stock of your coaching preparation. Are you ready to improve your teaching game? Go to coaching clinics, workshops, and take college coaching courses. Get books and DVDs to help take your game to a higher level. While you are getting your teaching skills "in shape", don't forget the mental and spiritual preparation it will take in order for you to get to a higher level of teaching and to enable you to better guide your players to their own higher levels. The following was is one of the "electronic" handouts given to our players concerning the broad topic of being coachable and the basis it has in humility. Being coachable. Just what does that mean? One of the biggest sources of sin and problems in our lives is PRIDE. We don't like to admit we don't know, we are wrong or horrors, look stupid in front of our friends. 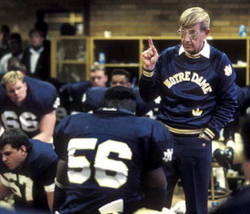 But is it wise to demonstrate our pride nature by being uncoachable? You have coaches to provide you with the wisdom you need to become a better player. Humbling yourself and learning from your coaches is the right thing to do (and yes, I am well aware we make mistakes as coaches - but we have the wisdom gained from decades of being involved with our sport and we really want to share that wisdom with you). Let's revisit one of the truisms from yesterday. Every choice you make effects others. Make sure you make the right choice. When you choose to be prideful and not pay attention, to not ask questions or to not tell the coaches you just don't understand, you are making a choice. 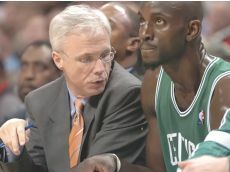 That choice might spare you immediate embarrassment or prevent you from looking "uncool" in front of your friends BUT you AND your teammates are going to suffer from your poor choice to be uncoachable. You don't know what to do or how to execute a given tactic and so the team suffers, either in practice or a game AND you look bad because you don't know what to do. Have you ever noticed the kids who do really well in school ask questions? I know it can be annoying to the other students who in their desire to look smart or cool, don't ask questions. But there is a connection between the students who ask questions and do well - they get the information they need in order to succeed. When you choose to be uncoachable, and it is a choice, you are not only negatively impacting yourself but your teammates. Everyone is "uncoachable" once in awhile - we just have bad days sometimes. But when you make it a consistent habit and you choose to do so, that is wrong. 1) you will improve - improvement is always a good thing. 2) the team will improve as a result of your improvement - improvement is always a good thing. 3) you will know what to do, how to do it, when to do it and will be able to perform better in a game and in practice. 4) you will be more confident because you know what to do. 5) you will be a better teammate because your decision to be coachable not only helps you, but it helps the team - which is always a good thing. 6) humility is one of the most important qualities a person can develop. 7) you will develop the positive habit of always trying to improve and learn - this will help you for the rest of your life. 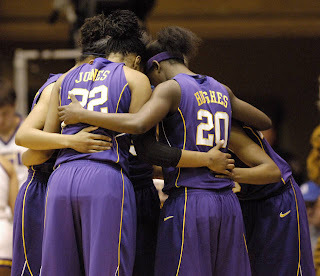 8) Humility will save you a great deal of pain in life - pain caused by your pride and being "uncoachable." 9) Being "coachable" helps you to have a servant's heart. One of the greatest sources of joy in life is serving others. 10) Being "coachable" helps lessen the likelihood of making mistakes, thus avoiding the very thing you most feared - looking silly or screwing up in front of your friends. By the way, REAL friends are OK with you making mistakes and messing up in front of them when you are learning. So - ask questions, pay attention, say you don't understand - it's a good thing. 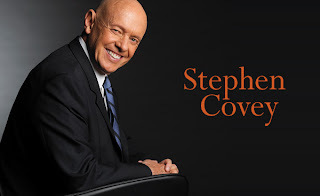 In today's publishing climate, how do you sell a book about a retired basketball coach from a little-known Div. II school in the upper Midwest? That was the question worrying Buster Olney, author of the recently published "How Lucky You Can Be, the story of Don Meyer," the former men's basketball coach at Northern State University in Aberdeen, S.D., whose horrific 2008 car wreck resulted in the amputation of much of his left leg, as well as the discovery that he has terminal cancer. But it turns out that Meyer, 65, whose 923 career wins are the most for a men's NCAA basketball coach, is famous not only in South Dakota, where he has lived for 11 years, but also within a large fraternity of folks who love sharing inspirational tales: other coaches. And their enthusiasm has turned the book into a surprise success. "In the coaching community Don Meyer is a giant," says Eastland (Texas) High boys' coach Doug Galyean, who says he would buy the book "by the case" if he had the money. "He has 923 wins, but he's responsible for thousands more because of the way he has shared everything he has with coaches across the nation." Olney delves into Meyer's contributions as a teacher—when he coached at Lipscomb University from 1976 through 1999 he ran the country's largest basketball camp—but the book's most compelling story line is how the accident gave the once reticent Meyer the voice to express his love for and gratitude to others. Says Peggy Bieber, owner of Chapter I Book Center in Aberdeen, which has sold more than 700 copies in just two weeks, "The book is really about life and how to live it." That's a theme that resonates beyond basketball and South Dakota. New York Life executive and part-time high school coach Mark Pfaff, who has brought Meyer in to speak at company meetings, has ordered 700 copies for his managers. Meyer, who has already outlived his two-year prognosis, has been making appearances with Olney on behalf of the book. "The greatest reviews," says the coach, "are from people who say they aren't basketball or sports fans but still couldn't put the book down. And then most say they end up crying reading it. Crying or laughing." Finished "Play Their Hearts out" by @georgedohrmann What can be gained by reading this book? 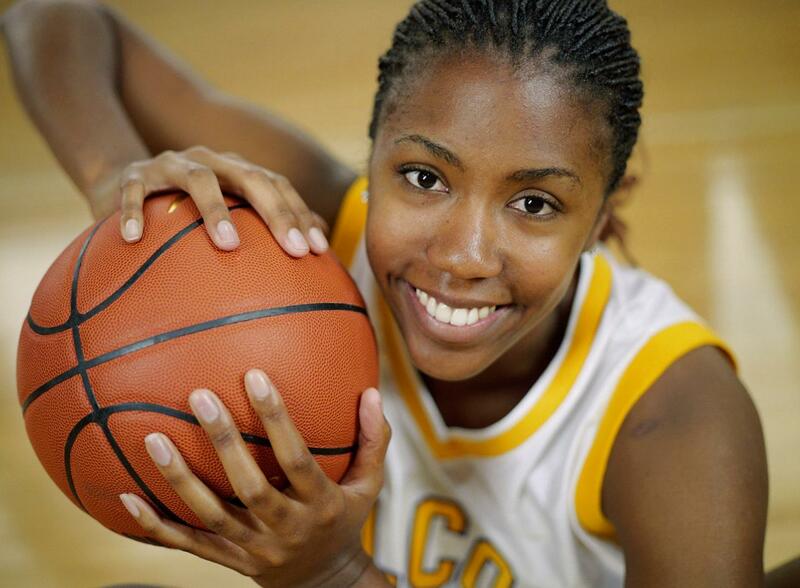 If you're a parent of a talented basketball player, it's a must read. 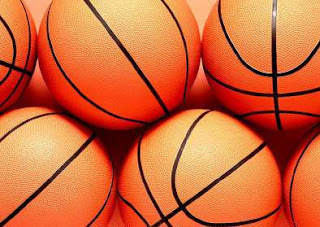 You'll learn a lot about the pitfalls of youth basketball and the importance of shepherding your child through this maze of deceit, corruption and confusion. 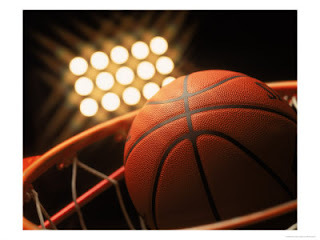 Hopefully, readers will understand the folly that is grassroots basketball and how it's not a necessity in the middle or early high school years to expose your child to the endless stream of games that are a part of travel team basketball. Sonny Vaccaro's advice to Roberto Nelson's dad about being selective about the camps/tournaments a child attends and making certain that young players are mentally and psychologically ready to handle the stress of these events sounds the strongest chord with me: http://tl.gd/76eo22 I also appreciate the comments of Ryan Smith, Demetrius Walker's High School coach in his sophomore year at Fontana High: "Going to tournaments all over the country isn't going to help you. 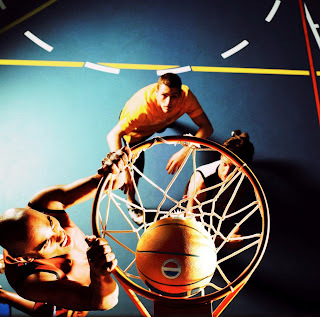 What you need is to spend every hour in the gym, working on individual skills. 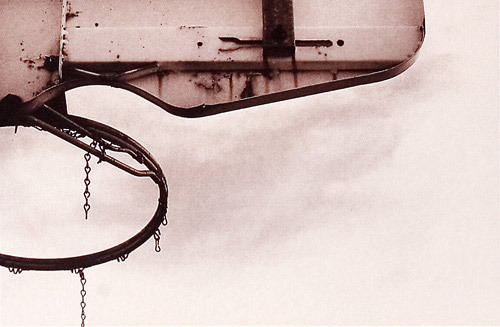 I don't think you should play grassroots basketball at all." There's no substitute for skill development in basketball. You can play all of the basketball you want, but if you don't master the fundamentals of the game, your game will be exposed at higher levels of competition. Best to strike a balance between skill development and playing the game. Don't rush the process parents! Find a trustworthy coach, who knows the game of basketball. Watch various practices before committing your child to a program. If you watch a variety of practices conducted by different coaches, you'll eventually be able to tell if a coach is organized and has a sound philosophy and teaching style. Don't sell your son to the highest bidder. So many stories in this book about parents who abrogated their duties as a parent. 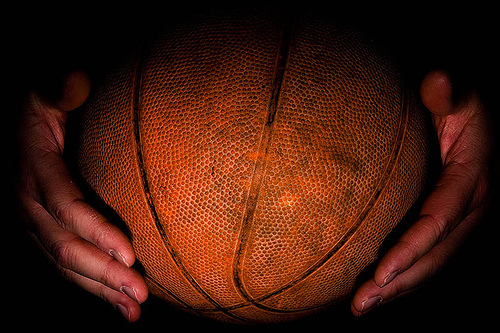 Chasing the celebrity of basketball is a powerful elixir for both parent and child. Don't fall for the hype! The amount of rules violations conducted at the college level is to be expected. I'm not naive, but the rules violations and payoffs that are detailed in this book at the high school and travel team level is very disconcerting. How the hell do you garner the respect of a kid when you're paying his mother's rent or putting him up in an apartment by himself in an affluent area at the age of 16. Talk about growing up too fast! Athletes often talk about the plantation mentality that schools, teams and people have towards them because of their unique talents. Joe Keller, the antagonist in this book devised a sophisticated form of slavery to build his fortune, his American dream. The fact that he did it and is still doing it off middle school athletes with the blessing of their parents is the tragic component of this tale. Parents, please let your children be children! This book is a wake-up call to parents of young athletes to slow the process down. Don't let your child be "The Hurried Child." If you don't understand the ramifications of "The Hurried Child," read David Elkind's fine book http://bit.ly/a0tnLZ on the consequences of putting children in harms way by exposing them to too much too soon. I hope parents heed my message, but I'm not counting on it. NOTE TO BASKETBALL PARENTS - I'm a former NBA scout. Rankings at the highest level never mattered to me. All I cared about was a player's game, not a number on a piece of paper. That Demetrius Walker's mind was programmed at such an early age by Joe Keller to fixate on a number is the highest form of psychological child abuse. Demetrius' growth as a basketball player and a human being was stunted as a result of adults prioritizing an "agenda" instead of a long range "objective." It's a testimony to him and the positive adults that he encountered post Keller that he is as well adjusted today as is represented in the Epilogue. My hero in this book is Ryan Smith, Demetrius' High School Coach in his sophomore year. A young coach with old school values who turned the tide for Demetrius by stressing fundamentals and discipline. That Ryan was Demetrius' accidental coach is just one more example that there is a God. When Demetrius needed a positive mentor at a crossroads moment in his life, out of nowhere came Ryan Smith. Parents, always go for substance and character, over style and flash when choosing a coach/program for your child. Leadership is, above all, courageous. Check out Kevin's DVD/ebook series...I have few and they are all excellent...he's a great teacher! "Great leaders are never satisfied with current levels of performance. They are restlessly driven by possibilities and potential achievements." "No man ever reached to excellence in any one art or profession without having passed through the slow and painful process of study and preparation." In life, the prize goes to the person, not who's the smartest or most talented, it goes to the person with passion. 1) Take an inventory of the work activities that you enjoy, and in which you excel. What energizes you and makes you feel alive about them? Passion won't take you anywhere unless you combine it with disciplined practice. Malcolm Gladwell, in his book Outliers, studies success and discovers that innate talent has a lot less to do excellence than does practice. In fact, he found that the successful people he studied (the Beatles, Bill Gates) put in 10,000 hours of practice before making a big splash. Nobody cruises to the top on natural giftedness alone. As Gladwell writes, "Practice isn't the thing you do once you're good. It's the thing you do that makes you good." 3) Set aside time on your calendar (30 minutes or so), twice a month for the next four months, to pause and evaluate how you're doing in honoring your core values. "We signed about 1,000 books in Sioux Falls, Fargo and Aberdeen over the last three days, and the stores here sold about 1,500 Thursday thru Saturday. Coach Meyer is getting e-mails from coaches who have just finished reading and are now ordering the books for each of the kids in their programs." Great idea! Will purchase some for our team as well. On your own team, is there someone who brings out your competitive nature? Too often in the professional world, the notion of "competition" is a negative image of a rival company or product; but competition can be a positive force, as well. And that competition may well come from within our own family! We all owe it to ourselves to find those people whose presence inspires us to do more with our talents and opportunities. By developing and maintaining meaningful relationships with people who continually push us to grow, we learn not only how to develop ourselves, but how to celebrate the accomplishments of others. 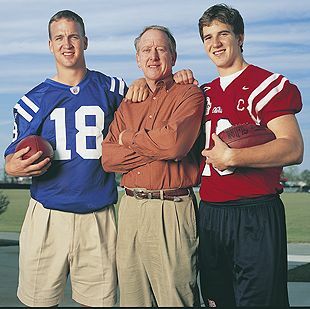 Much like how the Mannings both challenge and cheer one another, so, too, do other Great individuals. Who drives you to try harder, study more, prepare better, or reach higher? Whose friendship motivates you to work just a little bit more? If you can point to someone on your team -- or your family -- who fills that role, reflect on the recent way his or her presence has helped you raise your own game a notch or two and consider how to use that in the future. If you don't have such a person in your life, find someone who you can respect and engage with as you work together to improve your performance and stretch your professional muscles. It is no coincidence that success often runs in families or among tight groups of friends. Greatness surrounds itself with Greatness. It is your responsibility to find - and keep - those people who challenge you to always do better, even as you return the favor to them. Amiable rivalry teaches us to work harder, applaud others, and always keep reaching for our own Greatness. 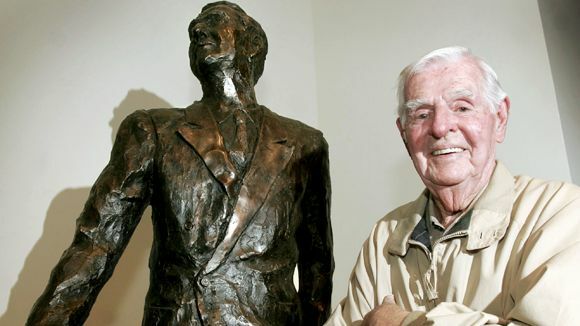 Players like Richard Taylor would take down his words daily throughout the year, every year; Taylor usually jotted a full page of notes every day, listening for the central truth in what Meyer talked about, rather than attempting to take down every word. 3. Have the right attitude. 4. Be positive; don’t criticize, look to compliment. 5. Improve every day, especially as a person. 7. Know that no one can beat you; you beat yourself. Morale is what motivates the best to get better. As you think, so you shall be. A spirit of devotion and enthusiasm for the team and pupose… Until you find a purpose higher than winning, you will never win. 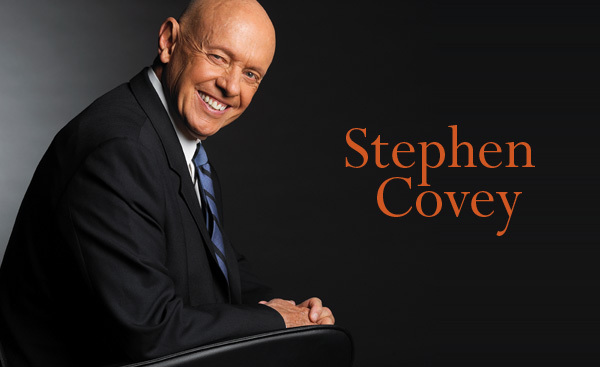 BOB STARKEY: This book was far better than I had imagined. Coach Meyer is a coaches' coach and Buster Olney does an amazing job of weaving Coach Meyer's life story into his coaching methodology. There are so many stories relayed by players and coaches that give you an inside to how and why Coach Meyer was so successful as a coach and so loved by his players. It is also an emotional ride of the pain and struggle Coach and his family have gone through over the last couple of years. I've already bought 10 books to give to some friends of mine in the profession and placed another order today. I've said it many times, I know of no one that has impacted our game more than Coach Meyer. 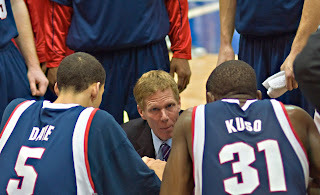 He has impacted the major college level on both the men's and women's side all the way down to the junior high level. He has devoted his life to helping us become better coaches. I've known Coach for almost two decades and there was a great deal that I discovered about him through Buster's writing. If you haven't already, be sure to get a copy -- I promise it's a great read! 1. Make contact by the line of scrimmage (the half line), and form a wall with some depth. 2. Chase around the screen. IF you short cut, you'd better get there. 3. The man guarding the screener must extend the bump. 4. Close out with high hands. Upper arms parallel to the floor. 5. Ignore the three point line when guarding a "Dead 3's". 6. Straddle the lane on helpside against a "Dead 3's". 7. 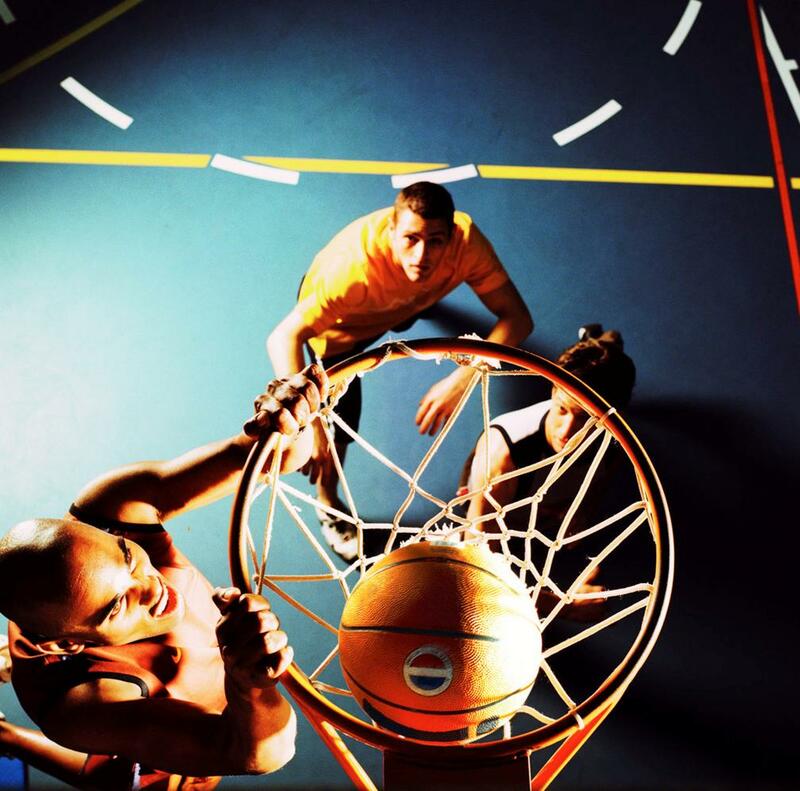 Give great shot pressure without fouling. 8. Block Out a man, Pursue the ball, Chin the Rebound, Outlet. Don't give up any second shots. He won't miss tow in a row.. I got this information from: www.coachmeyer.com -- a great resource center for coaches and players! 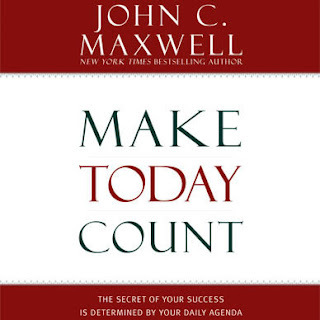 Our assigned reading for our team this year is John Maxwell's "Make Today Count." Our first worksheet deals with pages 1 through 11 on "Attitude." In that section, Maxwell gives us attitude pointers. They are listed below. We asked our team to pick one they could improve on and then explain how. ..... b. It is not about you!!! Focus on the team. ..... a. Denial of what is right in front of you! ..... b. Overnight success takes 20 years! "A team changing from offense to defense is one of the most difficult things in basketball. Exploit this!" 1. On a miss, free-for-all, score as quickly as possible. 2. 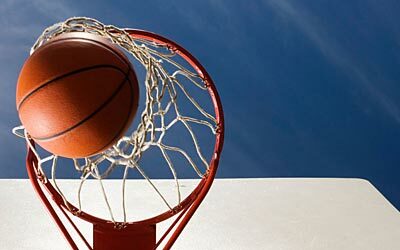 On a make, we want the ball the inbounded as quickly as possible by whichever big is closest to the ball and we want the ball advanced up the floor as quickly as possible as well. Teaching Point: In UF’s practices, ball isn’t across half court in 3 seconds it is an automatic turnover. 3. No set lanes, he wants his players to play. 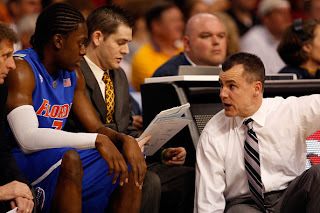 Coach Donovan wants his wings to run their lanes as wide as possible and sprint up the floor. If the two happen to be on the same side, it’s the 2nd player’s responsibility to call “push” and send the first wing through to the other side. 4. Utilization of random ball screens: If our first big down the court is behind the ball or not in position to get the ball in the low post in transition, it’s an automatic flat ball screen for strongside wing (trailing big can run in to set a double). DO YOU HAVE A READING TEAM? We are big believers in give our players things to read...books...magazine articles...passouts. It's a great way to pass on information. 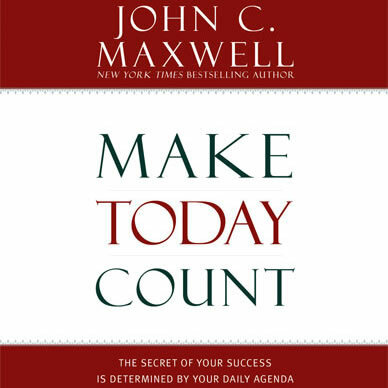 Each year during the season we give our team a book to ready (this year it is "Make Today Count" by John Maxwell) and we have accompanying worksheets to see how they are filtering what they read. 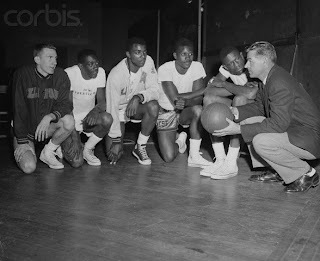 Coach would also sometimes bring books to practice, buying copies of books for the whole team, including John Wooden’s book, Wooden: A Lifetime of Observations and Reflections on and off the Court, among others. I think Coach did this for two reasons. First, Coach Meyer simply loved the game of basketball and he loved to teach, and whenever he found any type of useful information about basketball he wanted to share it with his players, just as a teacher would share information with his or her class. Secondly, Coach Meyer was giving us a huge competitive edge because we began to learn the game; not just play the game, but actually learn the game. By writing in our notebooks, reading articles from different experts of the game, and continually studying every aspect of the game we eventually would become a smart team. And, when two teams play that are equal in talent, we believed the winner would be the team that was smarter on the floor. We always wanted to be that team. Here is some more great stuff from Brian Tracy on time management. 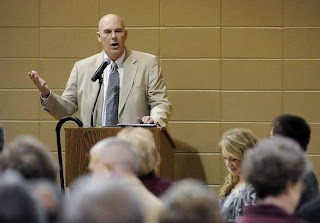 Two of the most organized people I have known are Coach Don Meyer and Coach Dale Brown. To me, the thing I learned about time management from these two is to have a system that you believe in and and use it daily. Coach Meyer is big on his planner. He carried with him where ever he went. He was constantly referring to it, writing something down it, using it to its full capacity. He utilized all the facets involved in his planner system. Coach Brown simply used a yellow-legal pad but wrote down everything he wanted to get done and then meticulously checked it off as he went through day. There are five time management tools and techniques that you should practice for maximum productivity and good personal organization. Each of them takes a little time to learn and master, but pays you back in greater efficiency and effectiveness for the rest of your life. 1. Use a time planner. The first time management tool that you need is a time planning system that contains everything you need to plan and organize your life. The best time planners, whether loose-leaf binders or electronic versions, enable you to plan for the year, the month, the week, and for each day. A good time planner will contain a master list where you can capture every task, goal, or required action as it comes up. This master list then becomes the core of your time-planning system. From this master list, you allocate individual tasks to various months, weeks, and days. 2. Always work from a list. Every effective executive works from a daily list. It is the most powerful tool ever discovered for maximum productivity. When you create your daily list, you begin by writing down every single task that you intend to complete over the course of the day. 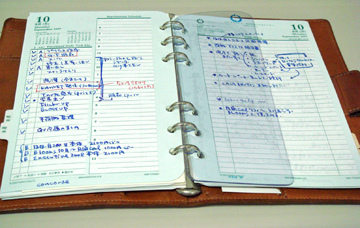 The rule is that you will increase your efficiency by 25 percent the very first day that you start using a list. This means that you will get two extra hours of productive time in an eight hour day from the simple act of making a list before you start work, of everything you have to do that day. You can bring order out of chaos faster with a list than with any other time management tool. 3. Organize your list by priority. Once you have a list for your day's activities, the next step is for you to organize this list in order of priority. Once your list is organized, it becomes a map to guide you from morning to evening in the most effective and efficient way. This guide tells you what you have to do and what is more or less important. You will soon develop the habit of using your list as a blueprint for the day. 4. Use any time management system you like. The variety of personal digital assistants (PDA's) and computer-based time management systems available today is absolutely wonderful. No matter what you do, in whatever field, there are digital time management systems that you can tap into or load onto your personal computer or mobile device to help organize every part of your life. 5. Set up a "45-file system." There is a simple method of organizing your time and your schedule for up to two years in advance. It is called the "45-file system." This is a tickler file that lets you plan and organize your activities and callbacks for the next twenty-four months. This is how it works. First you get a box of forty-five files with fourteen hanging files to put them in. The forty-five files are divided as follows: There are thirty-one files numbered one through thirty-one for the days of the month. There are twelve files for the months of the year. January through December. The last two files are for the next two years. This is a wonderful system that you can also use with hanging files in your desk drawer. It’s easy to get comfortable with success when you are the leader. The best will constantly evaluate what they are providing to those they lead. Answer these questions honestly. I think it will give you a good idea of your effectiveness. Come up with personal strategies to questions that raise a red flag for you. 1. How can they follow you if you are not helping them develop, not investing in them, too? 2. How can they follow you if you give them no true input or role in the outcome of success? How will they feel valued? 3. How can they follow your lead if you are asking them to work harder than you are willing to work or give more than you are willing to give? 4. How can they follow you if they don’t respect your knowledge and your willingness to continue to grow yourself? 5. How can they follow you if they know you are in it for yourself first? 6. How can they follow you if they don’t see and feel your passion for the job? 7. How can they follow you if you give them no true vision to follow? 8. Are you just “occupying the seat” of leadership or are you “executing the position”? There’s a big difference! Do yourself a favor first, and then to those you lead. Answer these questions honestly. They will keep you on track, or put you on track, to lead the way you should be leading. I am often asking myself the same questions and find that I have to readjust at times. The best leaders will do this self-check and continually assess the leadership they are -- or are not -- providing. "Don't mistake movement for achievement. It's easy to get faked out by being busy. The question is: Busy doing what?" Reminds me of Coach Wooden's "Don't mistake activity for achievement." We talk to our team about this in terms of our motion offense quite a bit. We want them to "move with a purpose" offensively. Running around is not motion -- it's, well, running around. Are you cutting to create help, screening to create help, maintaining spacing and balance? But you can see that it also pertains to life as well. Often we get got up being busying but not necessarily effective or efficient. "You have more control and influence than you think you do." These were the words of an economist I heard speak as he talked about the economy, the housing market and the recession. He reminded his audience that a lot of people make a lot of money during recessions. He stressed that these are the times when successful companies and successful people gain market share. He shouted when he told the group to look for buying opportunities over the next three years because there will be many. In essence he was saying not to let the economy dictate your situation and success. Rather, change your belief system and focus on opportunities instead of challenges. Reminds me of the "Positive Shark Formula" (also known as The Positive Success Formula) I wrote about in The Shark and The Goldfish. In the book, Sammy, a nice shark who feels that sharks get a bad rap and are in need of some positive publicity, teaches Gordy the goldfish that while we can’t control the events (E) in our life, we can control our positive energy and our positive actions (P) to these events and challenges and in turn this will determine the outcome (O). Indeed, we have more control than we think we do. Our positive energy, our belief system, our attitude, and our actions have a huge impact on the life we live and the success we enjoy. You can listen to the Constantly Negative News Channels and believe that success is impossible or you can change your belief and know that with God and an optimistic attitude, all things are possible. Instead of focusing on what they say you can't do, focus on what you can do. Instead of listening to the negative voices, focus on your positive choices. I'm not saying it will be easy. We will certainly be tested on our journey. I'm an optimist but also a realist. These are challenging times. We may lose our job. We may experience financial difficulties. We may not sell our house as fast as we'd like. We may have to start a new business or venture. We may have set backs. But if we apply the Positive Success Formula to our life I guarantee we will have a big say and influence in the outcome. Instead of letting the world create us we will have a significant role in creating our world. 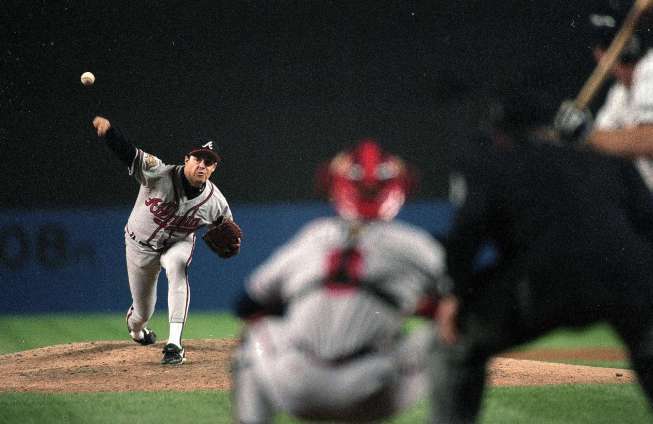 In the bullpen and between innings, Greg Maddux spends most of his time working out of the stretch. The toughest pitches during a game come from the stretch, and Maddux wants to be ready, both physically and mentally. Knowing that he can make his best pitches from the stretch in the bullpen builds a confidence that carries over into the game. Practice is a time to build confidence. Consistently doing it right in practice builds confidence that carries over into the game. Being prepared also means being well conditioned. Added strength and stamina from workouts give an athlete confidence in his physical abilities to meet the challenges of competition. It may sound almost circular, but confidence breeds success, and success leads to confidence. The trick is to use success to build a level of confidence. A process of replay and pre-play enhances confidence. A player can replay past successes in his mind, recalling past successes that have led to his current level. The pre-play is the process of visualization, in which an athlete envisions every situation in his mind in order to prepare for what will actually occur on the field. Curt Schilling goes so far as to acquire his own personal computer program that plays his previous outings in order to help him prepare for upcoming games. In visualization, as we shall see, every thought should be positive. Confidence does not always mean achievement—it means believing in the ability to overcome challenges and adversity. A confident player can fall into a slump and know that he will somehow find his way out rather than folding in despair. Statistics are kept for almost every facet of the game; from metrics on quickness, agility, assist to turnover ratios, points, offensive rebounds, defensive rebounds, steals, and the list goes on. Many smart coaches also track the mental toughness traits of their team during the pre-season and also in-season. As is commonly said, "mental toughness does not guarantee you a championship, but a lack of mental toughness is guaranteed to lose you a championship." 4) Ability to execute game strategy - regardless of opponent. A great exercise for any team is for the coach to rate each player on each facet of mental toughness on a 1 - 10 scale, and then rate the entire team on the same scale. Players should also rate themselves, and the coach should set some collective goals for improvement. This exercise should be repeated multiple times throughout the season. A few minutes after 7 on a chilly Wednesday morning, bleary-eyed students began filing into the Woody Hayes Athletic Center, lugging book bags and wearing Ohio State colors. Or else. "That's not Notre Dame Irish," Jim Tressel said in mock disapproval to Grace Miller near the team meeting room that twice a week doubles as a college classroom. Miller recoiled for an instant; the OSU senior and Dublin Scioto High School graduate was unsure whether the most famous professor on campus was kidding about the cursive Irish, her high school's nickname, stitched across her sweatshirt. He was. Sort of. But it was hard to tell that early in the morning. The Buckeyes' head football coach began his 7:30 a.m. class promptly at 7:28 because "everything is a race against time," he reminded his students. And so began Theory and Practice of Football Coaching, a three-credit-hour course taught by Tressel, with much help from football staff assistants, as well as former OSU head coaches John Cooper and Earle Bruce. It meets on Mondays and Wednesdays in the fall, with a "lab" on Fridays that sends students out to scout high-school football games. The course includes pop quizzes and a midterm heavy on football history. And students must design a high-school-level training program for a position of their choosing. "There's a lot more work than you would expect," Miller said. Tressel, the only coach in all of major-college football to teach an academic course during the season, was dressed Wednesday in a scarlet-and-gray short-sleeved nylon shirt - no vest. 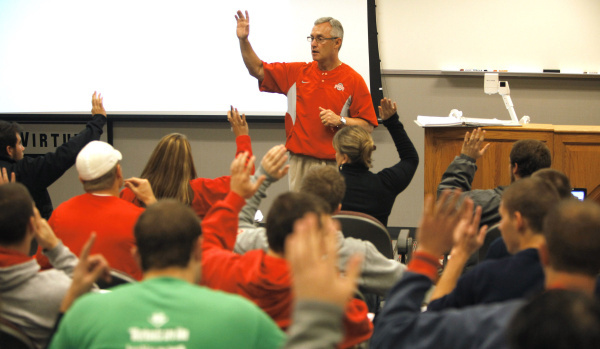 He immediately began the roll call for the 50 students (no football players), who come not only for the novelty of being taught by Tressel but also to learn about X's and O's. Some students, such as Miller, knew next to nothing about football when class began in September. "Now, I can watch it and actually know what's going on," the molecular-genetics major said. Other students, such as 64-year-old Vinny Sue Herwig, already understood the game but wanted to dig deeper. And Tressel provides students with a big shovel. "Tress says, 'Little things don't mean anything; little things mean everything,'" said Herwig, a Westerville hairdresser who attends the class free through the university's program for those 60 or older. A classmate is her 76-year-old friend Frank Barone, a former Ohio University business professor who has gone from thinking that football is a slow, crazy and silly game to something "sophisticated and complicated, with a beauty to it I have not seen before." 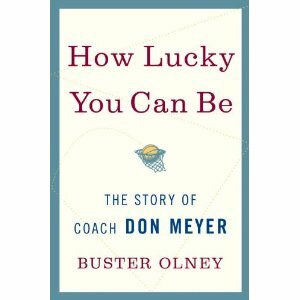 I just received an email from Buster Olney informing us that Random House has ordered a second printing of "How Lucky You Can Be: The Don Meyer Story." The book, written by Buster was only released on November 9. It is truly a well-written book about a special coach/person and one that all in our profession should read. I just bough 10 for our staff here at LSU. Thanks to all that have purchased the book and helped spread the word! Today is Veteran's Day -- but in fact everyday should be Veteran's Day...each day we spend freely doing that which we love we have a lifetime of Veteran's that made it possible. COACH NEWELL: "I WANTED TO MAKE THEM FIGURE IT OUT"
I think one of the most underrated things that the best coaches teach, in any sport on any level, is that of educating their players how to think on their own. Few were better than Coach Newell. “Don’t ever allow yourself to think you invented the game, or any part of it. But it doesn’t mean you can’t refine what you borrow." "Effective people lead their lives and manage their relationships around principles; ineffective people attempt to manage their time around priorities and their tasks around goals. 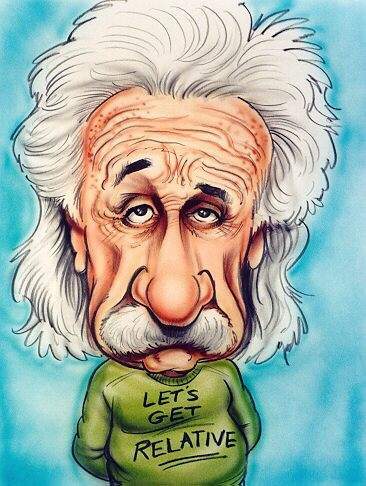 Think effectiveness with people; efficiency with things." Here is some great advice from Brian Tracy. I would challenge you to read it think how you could apply it to your program -- you players, support staff, administration. Do nice things for others. One of the best ways to influence someone is to do something nice for him. I know many successful salespeople who make a habit of taking their prospects out to breakfast or lunch. During the breakfast or lunch, they do not talk about their products or services unless the client brings it up. They merely make small talk, ask questions and listen. They work on building trust, and they work on establishing a friendly relationship. At the end of the breakfast or lunch, they tell the prospect that they will be getting in touch with him sometime in the future with the possibility of talking to him about helping him in some way. See them as friends and partners. 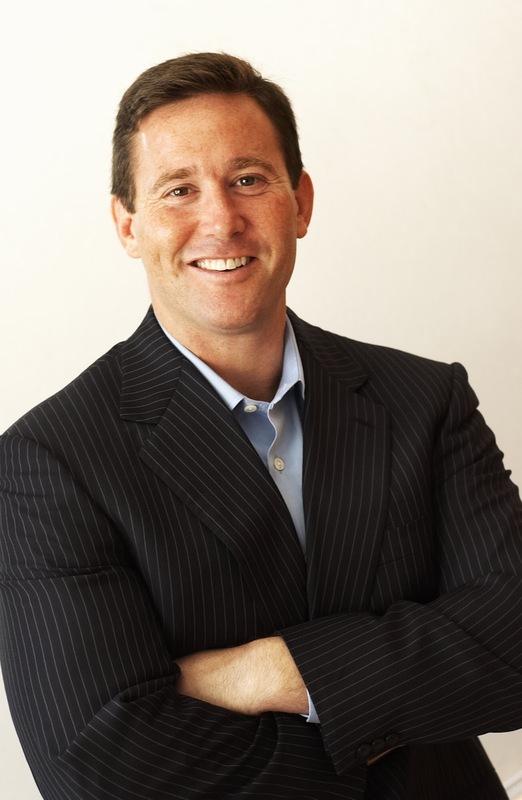 The best salespeople and businesspeople in America today are those who look upon their customers and prospective customers as friends and partners. They always look for ways to help their partners improve their lives in ways that are not directly related to the products or services they sell. They sow seeds, and they reap a harvest. They trigger a desire in people to reciprocate. When the time comes for those salespeople to approach their prospects with the possibility of buying their products or services, the prospects are wide open to the questions and inputs of the salespeople. The prospects have a deep-down desire to reciprocate. Send thank-you notes. One of the best ways to use this principle in your interactions is to continually look for ways to say and do positive things for people. Look for ways to do kind acts and favors for your friends and prospects. Send thank-you notes. Send birthday cards. Send clippings from newspapers about subjects that you feel may be of interest to them. Always keep your promises, and follow up on your commitments. Always do what you say you will do. Do everything possible to put in, knowing confidently that you will ultimately be able to get out far more. You will reap if you sow. Be a go-giver rather than a go-getter. Someone has observed that no one ever built a statue to a person to acknowledge what he or she got out of life. Statues are built only to people to acknowledge what they gave. The most powerful, influential and successful people you will ever meet always look for ways to do nice things for others. When you meet someone under almost any circumstance, one of the best questions you can ask is this: "Is there anything that I can do for you?" Always look for ways to put in rather than to take out. The successful man or woman of today is a "go-giver" as well as a go-getter. Be open and empathetic. The more that people feel that you are open and empathetic and sensitive to their needs and concerns, the more open they will be to your influencing them positively in some way. And the more you can influence others with the power and impact of your personality, the more you will accomplish, and the faster you will accomplish it—the more rapidly you will move toward the great success that you desire and deserve. Thomas Phillip One Feather-Bell - depressed, drinking and crying last week - came Sunday looking for God at First Lutheran Church. 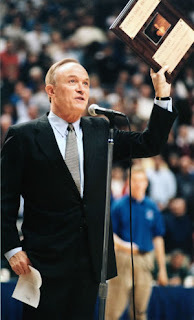 One Feather-Bell didn't know when he walked in the door at First Lutheran that he would be listening to the all-time wins leader in men's college basketball history instead. 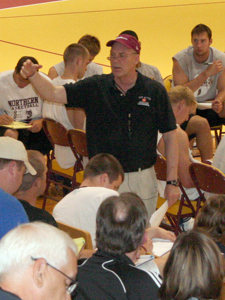 But what the young man heard from retired Northern State University Coach Don Meyer resonated with him on many levels. Meyer's emphasis on service, humility, respect and courtesy - and how they apply to congregations like they do to sports teams - struck a chord. "He talked about kids he was recruiting who were disrespectful to their parents while he visited them," One Feather-Bell said. "So he let them go, didn't recruit them anymore. That was pretty good." 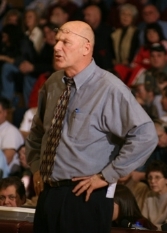 Meyer, 65, finished his 38th season last spring with 922 career victories. 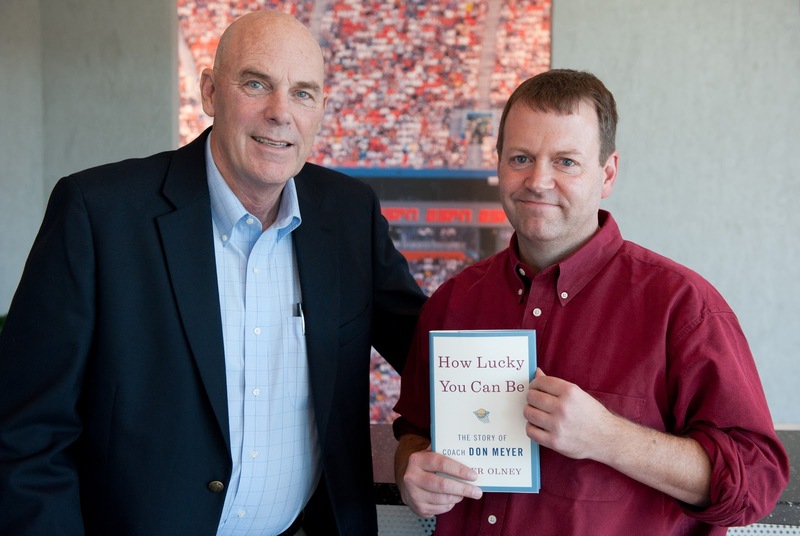 His story is coming out in a book, "How Lucky Can You Be: The Story of Coach Don Meyer," that was written by ESPN The Magazine senior writer Buster Olney and is being released Tuesday by Random House. Part of that story covers how, on Sept. 5, 2008, Meyer was leading a caravan of Northern State players on a team retreat when he fell asleep at the wheel and was involved in a head-on collision with a truck hauling 60,000 pounds of corn. The accident was almost fatal and eventually cost him much of his left leg. The night of the accident, the surgeon who worked to save his life discovered that Meyer had carcinoid cancer, a slow-growing form of the disease. Speaking at First Lutheran's weekly Adult Forum, Meyer injected good-natured humor with a message of how those listening could conduct themselves in church and in life. That included examples of being courteous to others, of picking up trash in all walks of life, and of encouraging the hard workers in congregations and not just those with the most talents. "God doesn't care about our talents," Meyer said. "He cares about our mind-set. Those people who have a 'B' in talent but an 'A' in mind-set will do so much more." Meyer told a story about what he considered to be one of the greatest examples of service leadership in the coaching profession - revered UCLA basketball coach John Wooden. A few days before his death June 4, 99-year-old Wooden asked his son to give him a shave, Meyer said. "I want to look good for Nell when I get up there," Wooden explained as he pointed to heaven, where he planned to be reunited with his departed wife. "That's how you want to live your life, with love, with faith," Meyer said. Just a few days removed from his despair, One Feather-Bell said those words made all the sense in the world to him. o All zones are strongest at the top, so they should be attacked from the side. o Any good zone offense will go through the series of overloading the zone, flattening it out, over loading etc. o Crash the boards. Most zones are stationary and react when the shot goes up. Since we are utilizing a continuity offense, our rebounders know the area of the floor from which a shot will most probably be taken and should be in position for an offensive rebound.